M. Chinnaswamy Stadium would witness the head to head of two IPL Champions who would look to lock their horns in the 2nd qualifier of the 10th edition of IPL 2017. On one hand, where KKR have retrieved their momentum with a confident win against SRH, Mumbai Indians, on the contrary have already registered two wins against KKR in the league matches. Let us keep our fingers crossed as if this match would be delayed due to rain, then Mumbai Indians would reach to the final as they are up in the points table as compared to KKR. Rahu is in Kethu star and Mars sub. 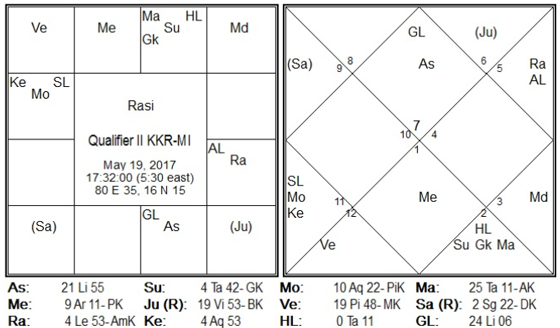 Kethu is in 4th house and Mars is in 8th house in own star. He rules the sub on 6th house and hence favorable for team in 7th house (MI). Astrologer is not a fortune teller but a “fate reader”. He has to disclose what is exactly in store for future regarding a particular question. Of course in a most careful manner, because his objective is only to create confidence in the mind of the querier rather than to frighten him. 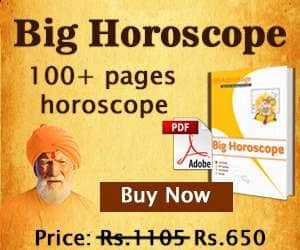 This is the toughest job on this globe.To consult astrologer V. G. Ramachandra Pavan, Please click here – Horoscope reading by V. G. Ramachandra Pavan. Disclaimer: This prediction is academic in nature and is meant for astrological research. It should not be used for any other purpose.